As there are no coincidences when it comes to God, let me tell you straight out that this particular fruit comes to us at the perfect time. We have a lot of prayer requests this week, and an equally great number of praises, but in the unspoken requests category, one of my biggest needs as a Christian brother is to learn to better draw upon the patience that God has granted me. I far to often tell others that I wasn’t given this particular fruit, but you know what, that is flat out not true. 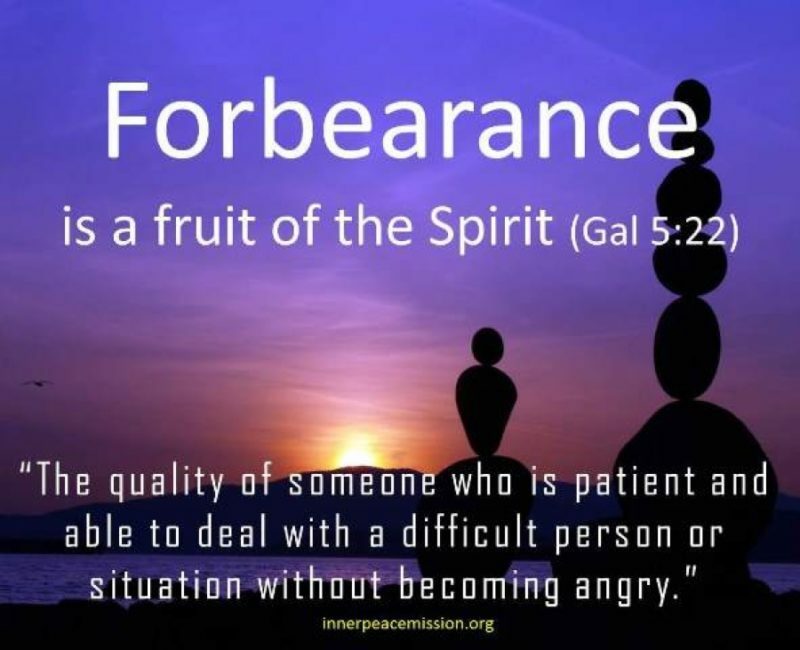 God doesn’t withhold from us the fruits of the Spirit — rather, it is us that choose to accept the fruit from Him, but by saying that you weren’t given a particular fruit, really, isn’t that a case where we are just blaming God for our shortcomings? If so, Lord, please forgive me and thank You for doing so. I’ll try and be better in the future. Before we feature our prayer requests and praises, let me ask you something. Do you ever have a situation where you need to make a decision on what to do — this path or that path — and just aren’t sure which path to take? I’m sure we all have been there. When that situation arises next, ask God what you should do, and then, wait for God’s answer. Listen from your heart about what He wants from you. He will tell you by way of the Holy Spirit, and then, when He tells you, make absolutely certain that you obey His direction. You will be glad you did. Now, please continue reading and praying with us our prayer requests and praises. this time, every year, my daughter has her annual appointment at the Hospital for Sick Children in Toronto. She has a rare eye condition called Ocular Melanosis (you can kind of see it in my profile pic). So far everything has been okay, but of course as a parent, I am anxious and worried. And thank you to Mike for his prayers last year when I asked for the same prayer request and posting Bible verses for me to read. I really appreciate it. Brandi has a prayer request: My husband has applied for a bank manager position and another position (not sure about the title) and I would love some prayers sent his way. His name is Brad. Thanks! Lori has a prayer request: I am awaiting and so hoping for an interview next week. This possible new job is literally 3 minutes from my home where I could come home and let my girls, Thelma & Louise, out at lunch!!! Please keep us in your prayers! UPDATE: Thank you all for your prayers!!! I have an interview on Monday afternoon! Literally 3 minutes from our home….God knows if it is meant to be! Jodi had a prayer request for the Facebook Group and a followup as well: My Mock 1 class for VIPKIDS is at 9AM (Eastern) Friday morning. Prayers appreciated! UPDATE: It went pretty well! I did advance to the Mock 2 class, which I will do Tuesday morning at 9AM, and *should* be offered a contract after that. Please pray for my friend Laura – she lost her Grandma. Please pray for my friends at UNC-TV. The Master Control and Transmitter Control folks are losing their jobs, and after a year of dread over this, finally have their date for termination — July 31st. They will be receiving severance packages but please pray for them to land on their feet quickly. -Removed some tissues waving in the aortic valveNow we wait for her to wake and come off the vent in ICU. Amanda has a prayer request regarding her husband Daniel. Please keep praying for this family! We got Daniel’s FoundationOne results today. There are some mutations which makes him a possible candidate for immunotherapy but there are not any FDA approved immunotherapy drugs that he is a candidate for. The good news is he is a candidate and there are several possible clinical trials. The bad news, it’s not something simple and we will have to travel for one of the trials. But I’ll take the answered prayers – we have options!! Thank you all for your prayers! Please continue to pray especially that we can be placed in a trial close to family/friends and that his numbers stay in the range they need to be to qualify for a trial. Also, my brother and SIL have just filed paperwork to foster to adopt a child. Please pray for them as well. Thanks again! Each of you are in my prayers daily! Sad news from my friend Mrs. Lucas. Please pray for her friend: Thanks for all the prayers for my friend’s husband, Tom. He passed away as there were too many complications. Pray for Trudy and their children, please! Jodi has another request for her family: Please keep my relatives in prayer! They had a mini-reunion over the 4th of July, and several have come down with a nasty virus, including my 99-yr-old grandma! She’s been in the ER twice for fluids and is doing ok, but my uncle Al, who was already in poor health due to a stroke last year is currently hospitalized and also fell yesterday. His wife, my other uncle & his lady-friend, my brother, my nephew, and my cousin’s wife all have this bug too. Now, how about some big praise reports! 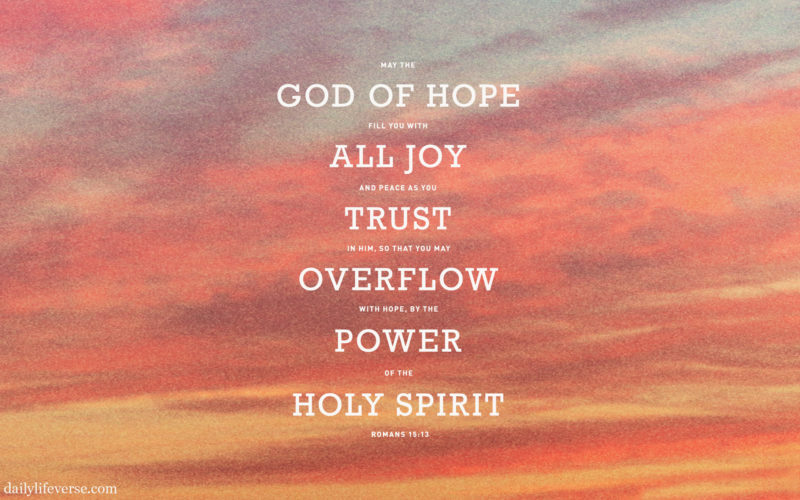 I’ll start us off: We’ve had a string of tough prayer requests lately, so let’s lift up a big praise! I’ll start. I’m praising God for my friend Maureen and her recent engagement to her soon to be husband Jamie! Congratulations Maureen! My sister Robin gave praise for Vacation Bible School at her church! Amanda has a praise: My brother and SIL decided to pursue adoption thru foster care!!! So excited! Pat has a praise regarding her son: My son was diagnosed with scoliosis & told that the more he grows, the worse it will get. They expected to have to put him in a brace at our last visit. Instead of getting worse, it actually improved with LESS curvature at our last doctor’s visit, no brace needed! I’m praying and believing in complete healing from it and total reversal of the curvature already there from it. Leslie is praising her soon to be daughter-in-law: Praising God for my new daughter-in-law in three weeks! The Lord really answered my prayers that my son find a wonderful woman to share his life with. Sheila is giving praise for their new 3 month old German Shepherd puppy named Queen! Jodi has a huge praise regarding her RA: I have a big praise! Just got a call from my Rheumatologist with lab and x-ray results. (I’ve had Rheumatoid Arthritis for 20 years!) The wrist x-rays show some narrowing of joint space but no damage or destruction! PRAISE! And a lab we do periodically to judge certain markers shows improvement. Two yrs ago I was in the severe range, one year ago in the moderate range, and today, I have dropped another 13 points and am in the MILD range!!! Big praises! So what are your prayer requests? And just as importantly, what praises to God do you want to share with us today? Whether you share them with us is irrelevant, but make sure you tell God how much you love Him! The Lord made that promise to the people of Israel while they were in exile in Babylon. They didn’t know that it would take 70 years of captivity before they would be released, but it did — and still they called on God to hear their prayer. Now, we can call of God directly through His Son Jesus Christ, and He will hear our prayers, and He will respond accordingly. My brothers, in my opinion there is no greater joy to be found than that! To those that are hurting right now, though, we lift up our prayers to God for you and your families. Please continue reading and pray with us our prayer requests and praises below. Jodi starts us off with a prayer request: Please keep my friend Caria and her family in prayer. Her father passed away this morning. Just last week, he fell while walking the dog and sustained a head injury. Not sure if something else was cause (anuerism, stroke?). Thankfully, he was a firm believer, as is Caria and her family, but it is still a difficult loss. Thank you! Amanda has a prayer request for her husband Daniel: My husband goes in for his PET Scan on Thursday morning. Please pray that the scan is better than the last (which was great! ), that it shows no new tumors or cancer, no spread of cancer, that the tumors that were resolved last scan are still resolved or gone and the other tumors are smaller and less active, resolved or gone. Please also pray that the FoundationOne test comes back that he is an candidate for immunotherapy and pray for us to have peace and give it to God between now and when we get the results next week some time. Thanks! Kipp has a prayer request: Please pray for Alan’s mom Phyllis who is in the hospital dealing with her Chrones disease this morning. This is a very chronic, debilitating sickness that takes its toll on the body. It is in the IBS family. (irritable bowel syndrome). Please pray for my cousins Janet and Susan and all of their families today. We lost my Great Aunt Genette today. She was a wonderful woman and I will remember her fondly from all the times she welcomed me into her home. Please pray for God’s Peace, Comfort, Strength, and Love to surround all of them in the days and weeks to come. Please pray for my sister-in-Christ Genevieve and her family. Her week started with her younger brother Mark being in a bike accident with a car, and being in ICU. They saw improvement, evidence of God’s miracles in his brain activity, and they prepared for him to be transported to a different hospital for further care. Then, the last thing any of them expected happened. Her brother’s heart failed, and they had to say their goodbyes to their brother, son, grandson, and friend. Please pray for Genevieve and her family; pray for their grief, pray for their broken hearts, pray for their shock at losing Mark when no one was expecting it. Pray that God would surround that family with His Peace, His Comfort, His Strength, and most of all, His Love, and that He would take care of them all each and every moment of every day. Pray that they would know the joy in knowing that Mark is with our Lord and Savior, Jesus Christ. Lastly, please pray for my friend Candice. Her mom passed away peacefully in the care of Hospice. Please pray for Candice and Martha and all of their family and friends that knew her. Remember that the Lord has plans for us, plans for our welfare, not for evil towards us, plans for our future, plans for us to have a hope. 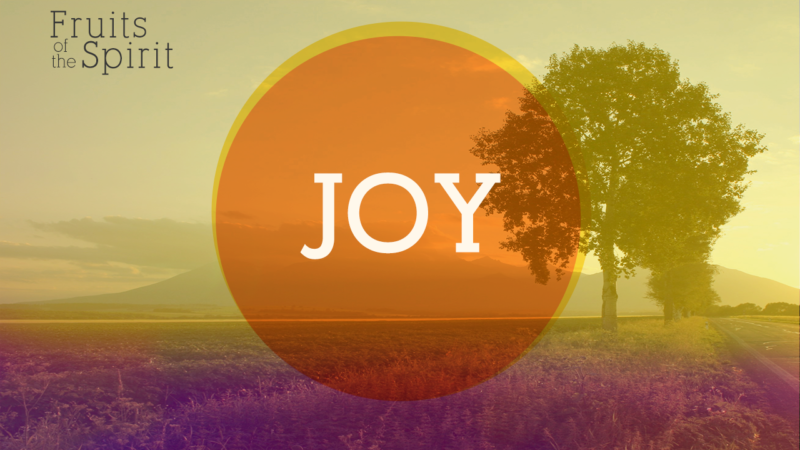 Remember to look for the joy even in the midst of all of the sorrow, anger, and hurt in our lives. Look for the joy. So tell me this morning, what is the state of your heart? Have you given any thought to what God would want from you? Do you ask Him to direct your steps, to change who you are from one who is about self to one that is selfless? Allow me to give you a little insight into the heart of Mike Ellis, Christian, Believer, Saved. What does it take to gain these last three adjectives? And what does any of this have to do with the state of your heart? Simply put, to be saved, to be born again, is to believe that Jesus Christ is the Son of God, that He came down on this earth, that He died on the Cross, that He was resurrected from death back to life, and that He did all of that to pay the penalty for our sins. If you are God-Fearing, you fear being separated from God. 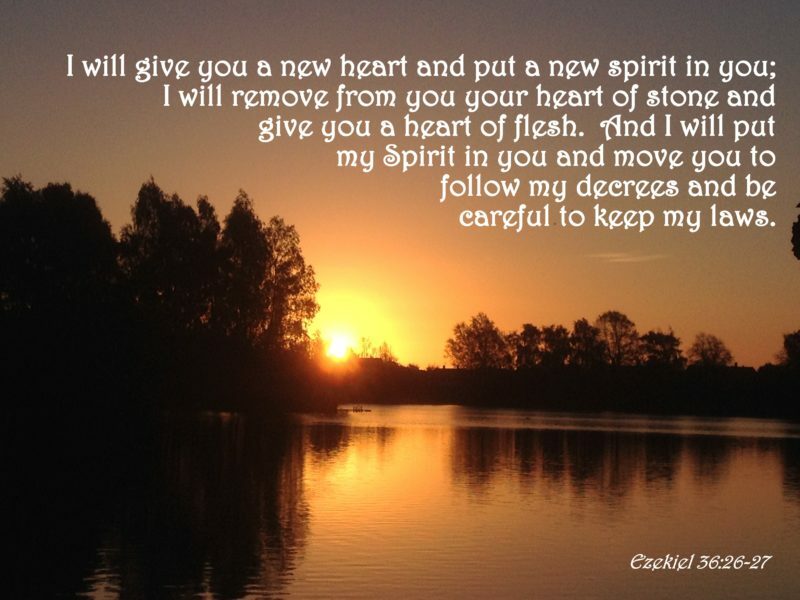 When you believe, and ask God into your life, you are Saved, and when that happens, you are Born Again, and the transformation of your heart as illustrated in the Ezekiel verses at the beginning of this post will take place immediately. Additionally, when that happens, the Holy Spirit will enter your heart, and the Holy Spirit will intercede on your behalf and talk to God with you and for you. 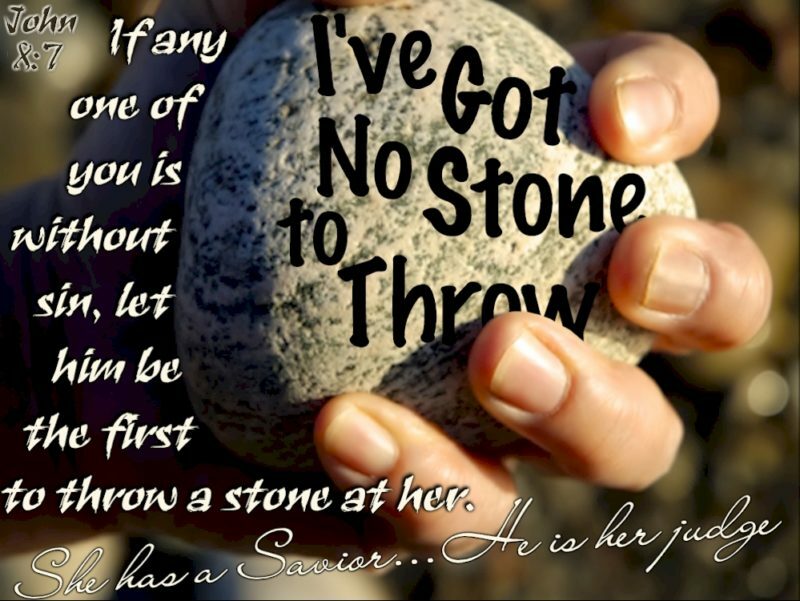 That is how your heart can be transformed from a heart of stone to a heart of flesh and spirit. Thank you for reading this far, please keep reading and pray with us our prayer requests and praises for this week. Do you want to share your prayers with us? Join our Facebook group and do so there, or leave us a comment with your prayer requests and we’ll pray that way as well! Stephanie starts us off with a prayer request: Please pray for my husband, Tim! I had to bring him to the ER because he’s having shortness of breath. He’s been given a breathing treatment and a steroid shot and was just taken back for a chest x-ray. Update: Tim is on some medications but still struggling, so please keep praying! We have been praying with Amanda on a request she has this week. This has been a roller coaster of emotions all week: Please pray for my brother and his K9. He is a K9 officer and his dog was hit by a truck. She has significant internal injuries and her rear leg was almost completely severed. She made it out of surgery for the internal organ damage (Praise God!) but must recover from that before they can address the leg. My brother prayed and waited many years to be a K9 officer and his first dog bit him so badly he was on desk duty for several months. His faith has never wavered He’s inconsolable and weighed down with guilt right now. Thanks to you all! UPDATE: Jelka was stable through the night and did not need a transfusion as expected. They still haven‘t addressed her leg and she has blood in her chest tube making them think she might have an internal injury they missed. Thank you for the prayers – they are working! UPDATED UPDATE: Jelka is in the clear! She will be going home in a few days. They haven’t done anything to her leg but the blood flow is good. If the tendons are in okay shape, they will repair but if not they will fuse the leg. She’ll most likely be able to go back to police work in the fall. Thank you all for your prayers! I told my brother my warriors got results! Then, this update: My brother’s K9 is not doing well. She is bleeding in her chest. They are taking her into surgery but aren’t confident she will make it out. Please pray! Lastly, this Praise! Thank you all so much for the prayers for my brother’s K9 partner. They have worked miracles. Here she is yesterday – only 3.5 days after she was hit! She still has to have surgery on her leg but wow! Here is a link to a video if you want to see how Jelka is progressing. Hiro has a praise report and a continued prayer request: I didn’t get a chance to thank all of you for your prayers a few weeks ago. My father is doing well. In fact, he has been talking about Jesus a lot. And he is reading the Bible and in class (he teaches Karate) he relates Karate Philosophy to Jesus’ stories. It’s fascinating. He grew up Buddhist and Shinto. So it’s deeply rooted in him. He also reads the teachings of many other religions as well because he has so many students around the world. A cool fact, He had a special tree planted in his honour when he visited Israel/Palestine (there was a brief time of peace a couple decades ago). So with all these religions he is influenced by I can imagine how difficult it is for him to follow one. But it’s been so wonderful to hear him talk of Jesus. Please continue to pray for him as he has many personal obstacles he has to overcome. Thank you Mike for this Facebook group. Please pray for Dakota Miller and his family, a 13 year old who accidentally shot himself, and is in critical condition. I am not sure of the status of his injuries at this time. There was some confusion as to the legitimacy of this prayer request as it seemed to closely resemble one that was a fake request going around Facebook, but here is a story about it that sheds more light on it. Continuing regarding Dakota Miller prayer request. Please pray with me: “Lord, we don’t know if the prayers that were lifted up were for an actual situation or not — only You know that. What we do know, Lord, is that real or imagined, hoax or true, we know that You care for us, and want what is best for us. Thank You for loving us as you do. We learn in our Bible the very true words written by the Apostle Paul as given to him by You in his letter to the Philippians: “6do not be anxious about anything, but in everything by prayer and supplication with thanksgiving let your requests be made known to God. 7And the peace of God, which surpasses all understanding, will guard your hearts and your minds in Christ Jesus. There are only two people that know the state of your heart: you and God. If you need us to pray for you, please ask, please let us lift you up to the Lord so that He can work a miracle in your life! Thank you for joining us and praying with us today!